I am not sure where I am going, so let’s get into this and hopefully, we can both come to the end having learned something. This mantra aforementioned is how I try to go about every new situation and I think this mindset can benefit many. Confidence is the ability to be sure of oneself or prospects and embrace the uncomfortable. I also know that if you have a gift and someone asks you to display that then you have a responsibility to it. I have been privileged to go abroad and learn in a new environment from different people. In a little over three weeks, I will be back in the States and I am processing the experiences I have had, isolating what I have learned, and how I can share that knowledge when I get back. This is what I know interacting with others on a common goal makes you grow. I went to an all women’s private college preparatory high school and that focused more on STEM than STEAM. Much of my work focused on a career in Engineering, so the work I pursued in Higher Ed and what I am doing here is a large departure from that. 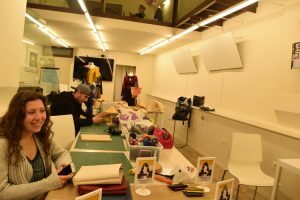 I am an industrial designer but while I am here I have been learning about traditional baroque straw hat making and leatherworking. It has been a blast. 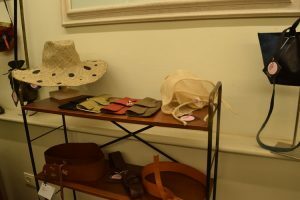 Last week, I was tasked along with my peers in two of my courses to provide workshops on techniques we have learned in leatherworking and straw hat making. What I can say about the two classes is that the dynamic is completely different. For my leatherworking course, there are 5 students including me and they are all women. For my other 9 of us with the majority leaning towards male with one extra male in the class. I can tell you the dynamics of the courses are very different: subjects and personalities. All of the women, for the most part, come from a design background, specifically Fashion, and the men, Business. The men bring a jolt of energy and excitement to the class that I can only describe as full. I am used to being in an environment that is relatively quiet and calm where everyone works by themselves on individual design problems. However, because of their lack of knowledge on the topic, it’s like we are almost required to all work together so everyone can produce the best outcome. That what is exactly what the event was like. Even though I am someone who is quiet and often prefer to work by myself just as a matter of habit was forced out of my comfort zone be the boisterous personalities of my male peers. I would be lying if I said that I was not annoyed at first but their jokes lightheartedness and lack of knowledge in the material allows them to be more experimental with their work and I love that. Even though their work is not the best technically, it is probably the most interesting and eye-catching work. My favorite is this fascinator one of them made inspired by paper planes. Cool! Right? They’re a great example using their gift when needed. They were able to engage visitors at the event and keep everyone in good spirits when it got busy and our professor needed help. Not everyone can do that. It seems small but the ability to engage with people and get them wanting to learn more is important. I guess why that’s why they are in Business.